Erin is at the age now where she has started to take an interest in puzzles and it's great to see her little brain working out what piece goes where. 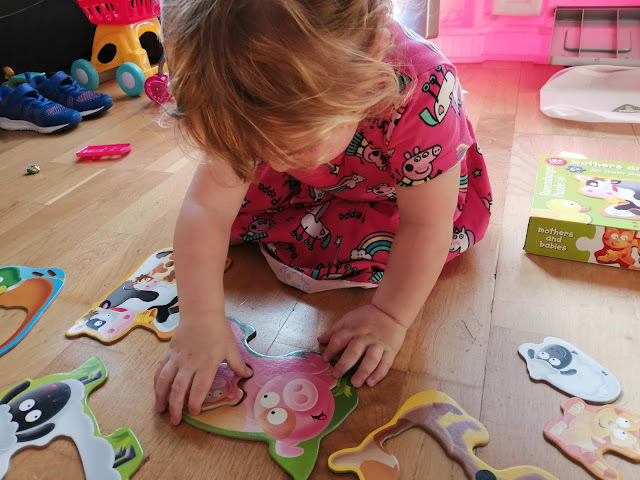 The problem with being a second child though is that all our puzzles are her brother's hand me downs and she doesn't actually have any of her own...oops! The Mothers and Babies set is aimed at toddlers from 18+ months and is a perfect introduction to puzzles. Containing 6 individual animal puzzles, each has two pieces. 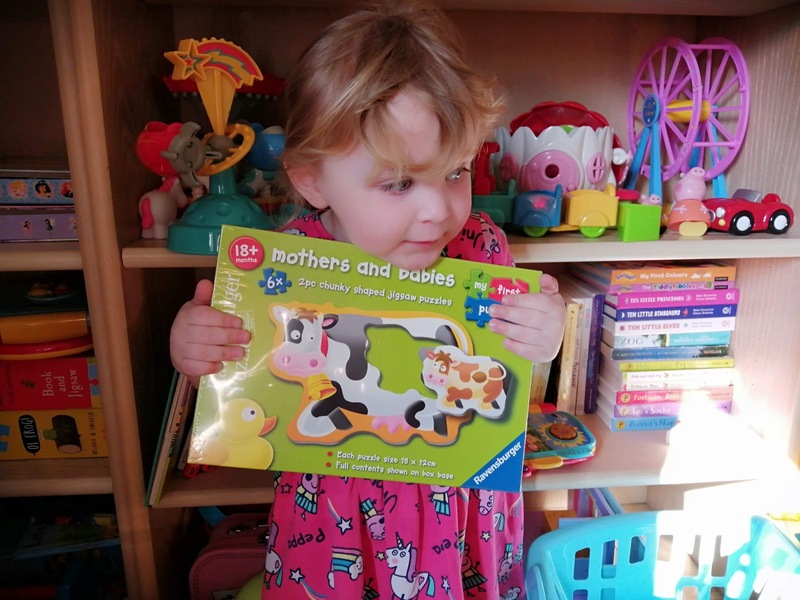 Featuring a cat, dog, sheep, cow, duck and pig the baby part is nestled in the Mum's tummy. 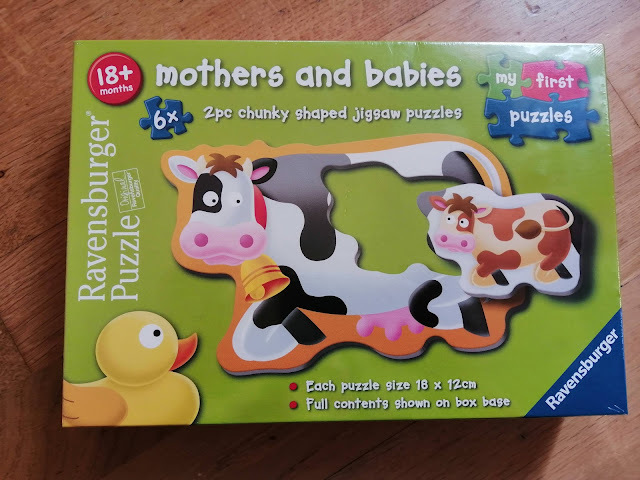 As with all Ravensburger puzzles, the quality is fantastic and each piece is made of sturdy, thick laminated cardboard. Some puzzles are so flimsy you know that they will bend and break but I know this one will endure the strength of a toddler and still be fine! Erin is 2 years and 3 months and she had no trouble working out which baby went where. I think possibly she might be at the upper age level of who this puzzle is suited for but it still made for an educational game, despite the simplicity of the puzzles. 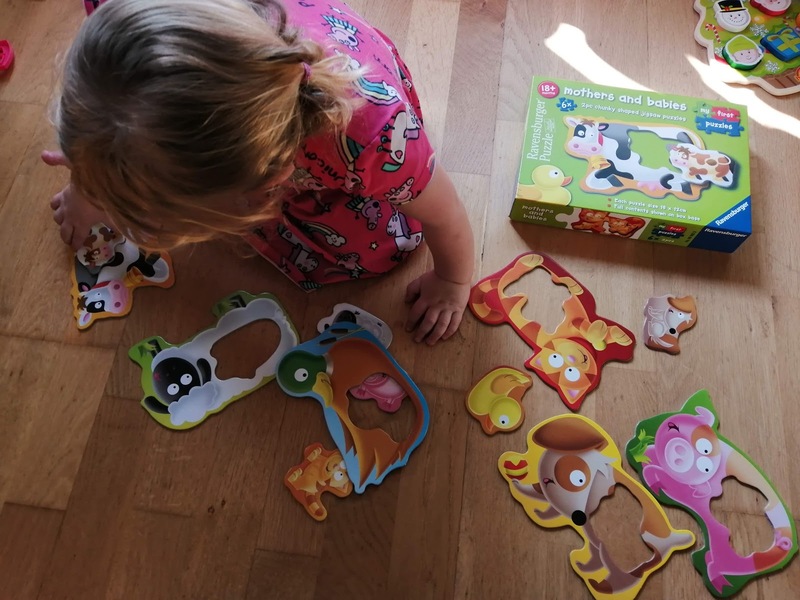 We talked about what noises the different animals made, and what colours she could see on the puzzles. We're Going on an Egg Hunt Book (£4) - Children will love the simple storyline, with the added bonus of flaps to lift! This book features some beautiful illustrations too. Bunny Pull Back Racers - Baker Ross (£2.45 for 4) - We always do an egg hunt in my parent's garden and I think these would be perfect for that so the kids are overloaded with chocolate! 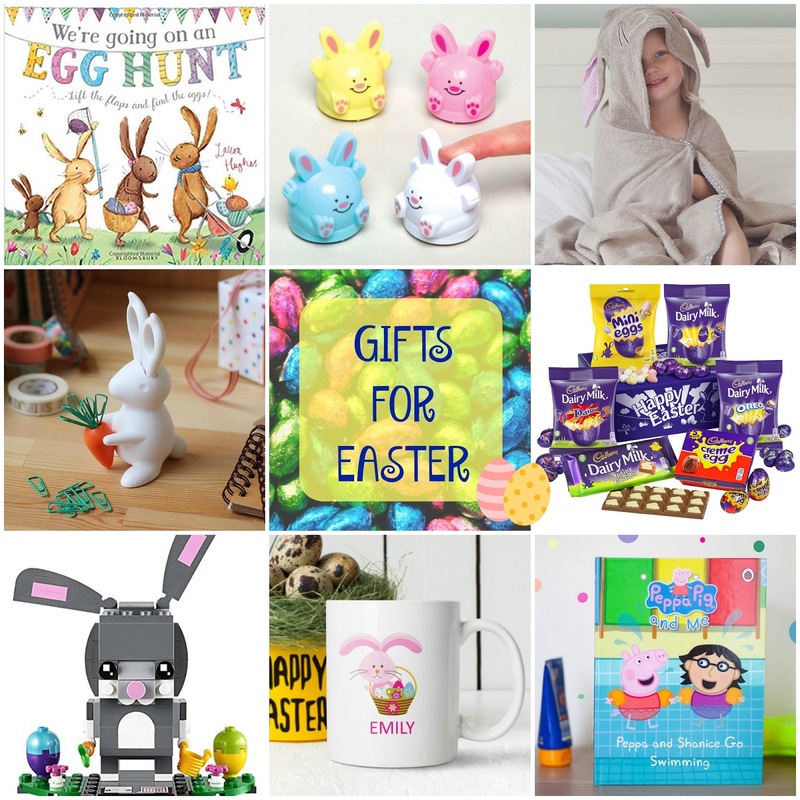 Cuddlebunny Hooded Bath Towel (£34.99) - For a special Easter gift, these bunny towels look adorable. The child sizes even go up to 3-6 years too which is fab as a lot of the hooded towels seem to be suited to smaller children. Bunny Scissors and Desk Organiser* (£23.50) - This is the cutest desk organiser I have ever seen and would make a lovely Easter gift for an older child. The scissors make up the ears, whilst the green paperclips create the carrot stalks. Cadburys Easter Eggstravaganza (£10) - Of course, Easter isn't Easter without a bit of chocolate and personally for me, it's all about Cadburys! Why does Easter chocolate taste even better than normal chocolate?!! Penwizard Personalised Books* (From £12.49) - For a really lovely gift that's a bit different, Penwizard create personalised books for children. Featuring lots of favourite characters such as Peppa Pig, In the Night Garden and Paw Patrol, kids will adore starring in the story as their very own customised character! We have a Peppa Pig one which Erin loves and the illustrations genuinely look like her which she finds hilarious! January seemed to drag on forever and it felt like half term would never arrive! But finally it was time to relax...I say relax in the loosest sense as we had an action packed week planned. But still, there was no school run! The first day of the holidays saw us having a split day - I spent the day with my choir on an Abba Workshop which was brilliant fun! 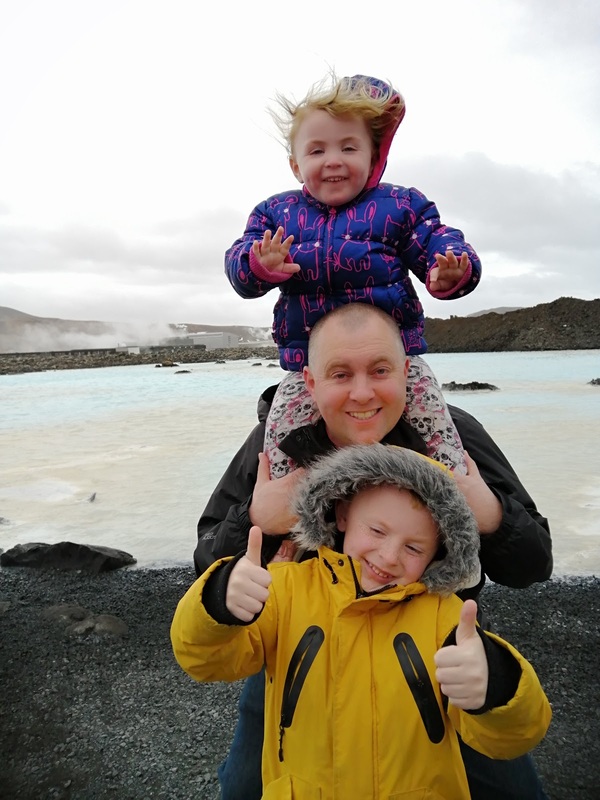 The children had a day with Paul which was nice as they don't get to do it without me very often. The weather was a bit drizzly but he took them out for a long walk to a place called Upton Country Park. 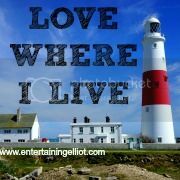 It's somewhere we love visiting and it's great because it's walking distance from our house, and there is always something fun to do! 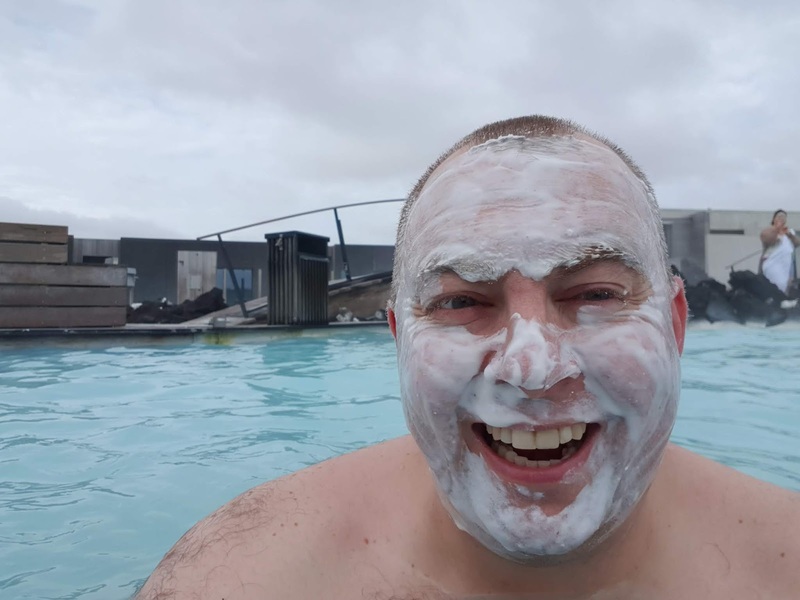 He did make me laugh though, he packed a picnic for the kids but said they were still hungry and wanted something else....welcome to my life hah! Always blimmin hungry! 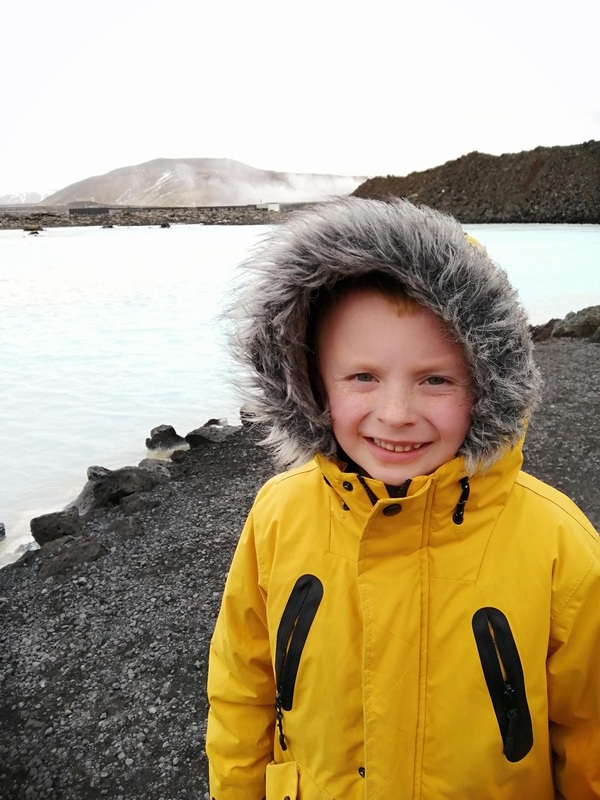 This is fast becoming Elliot's favourite place to visit, in fact he's been there three times since December! 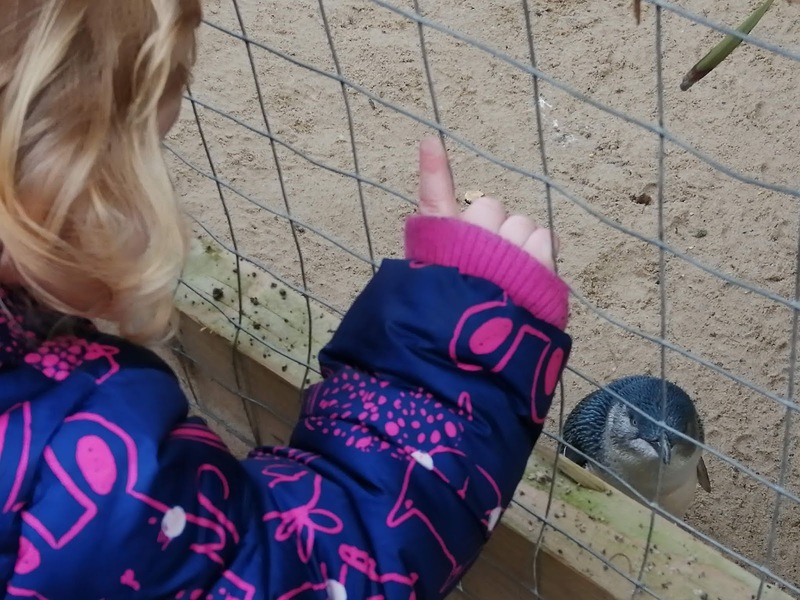 We went along to review the half term activities and we had a brilliant day. There is so much to do and is definitely a full day out. Erin loves it too, she's too young to understand the science behind the experiments but give her a button to press and she's happy! 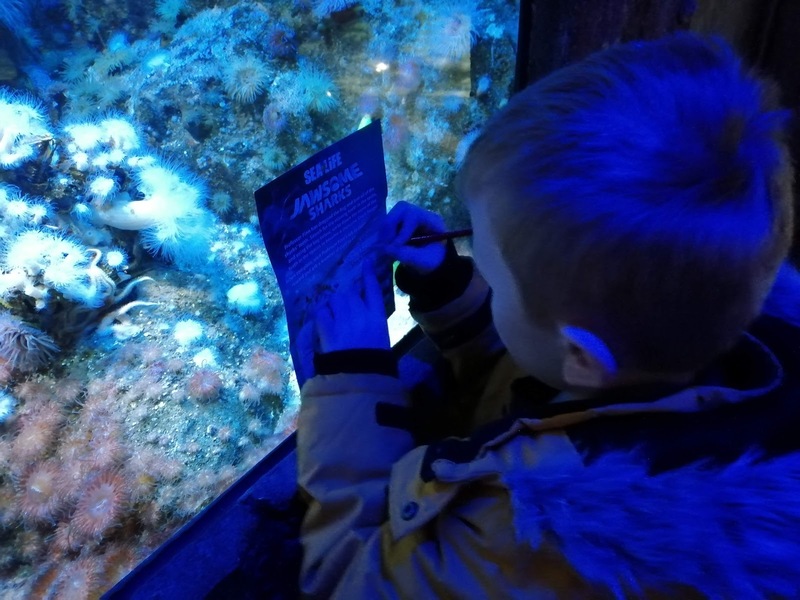 We've recently become Blogger Ambassadors for Weymouth SEA LIFE and it's somewhere we really enjoy visiting. The kids were looking forward to taking part in the Jawsome Sharks event and I was looking forward to seeing the Fairy Penguins - who are extremely cute by the way! Kingston Lacy is very popular at this time of year with thousands of people visiting to see the beautiful snowdrops. It certainly seemed like most of Dorset were there the same time as us judging by the number of cars in the carpark and queues in the cafe! 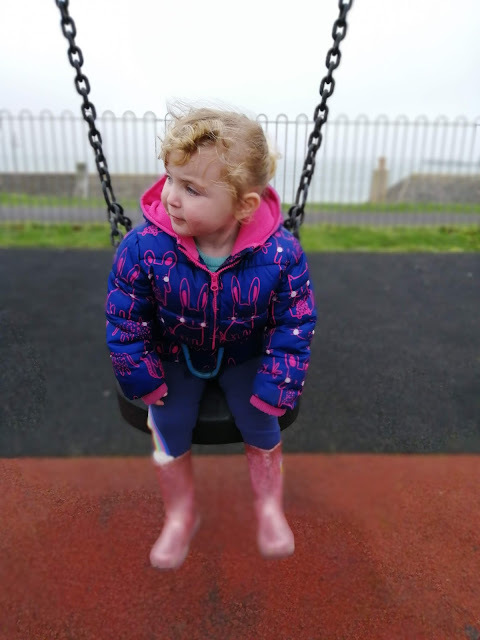 It was a funny old morning with lots of sunshine and torrential showers but the kids didn't care about the rain, they just had lots of fun playing with their friends. 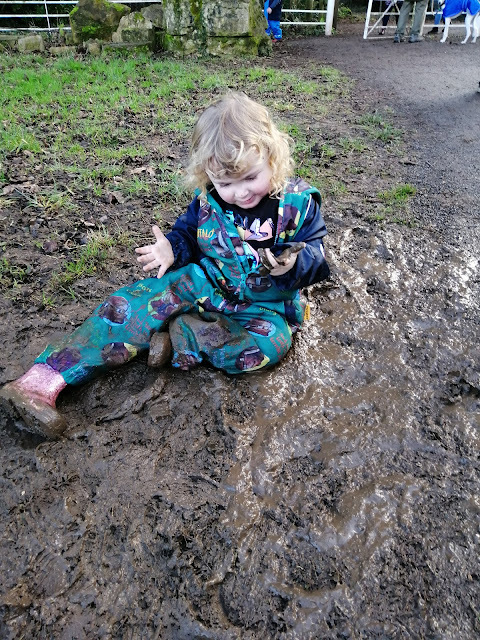 We did have a muddy incident though...Erin decided that stomping in it wasn't enough and she ended up sitting in a very thick muddy puddle! 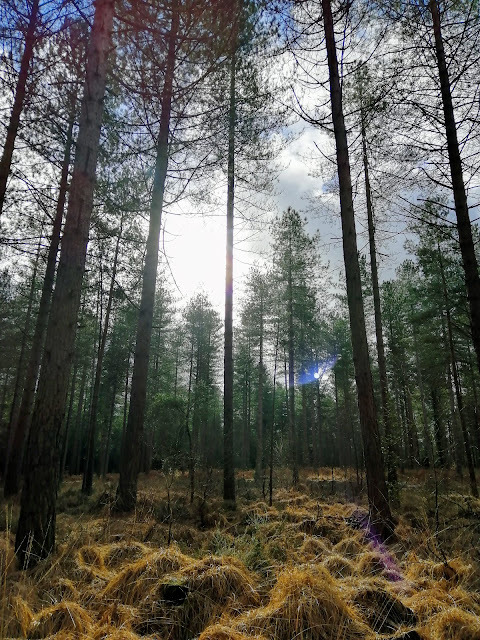 Moors Valley is always a great place to visit as there are acres of forest to explore with lots of play trails along the way. 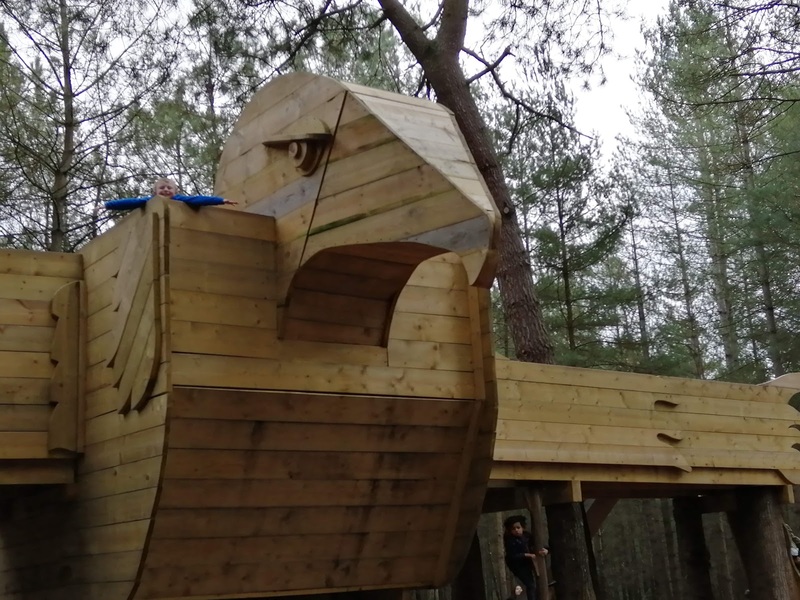 There is also the brand new Zog trail! 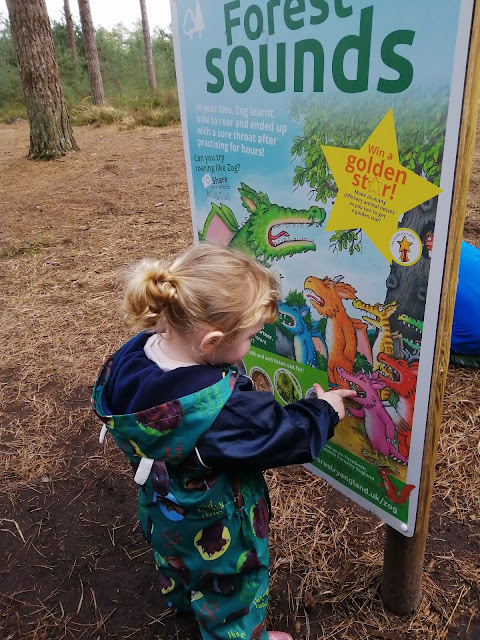 We didn't do the full trail which involves purchasing an activity pack from the information centre but we enjoyed spotting the Zog pictures along the way. We went with a couple of our friends and the children had a brilliant time playing on the wooden play areas. Thankfully we had no mud incidents although Elliot did manage to split his welly boots! The weather looked lovely for Friday so we headed down to the seaside town of Swanage with some friends. Unfortunately the weatherman got it wrong and we drove into Swange in thick mist! It was pretty chilly too so not quite the warm Spring day we were hoping for. Never mind, we had lots of fun playing in the park, spending all our 2ps in the arcade - we even went to Wimpy, how retro! 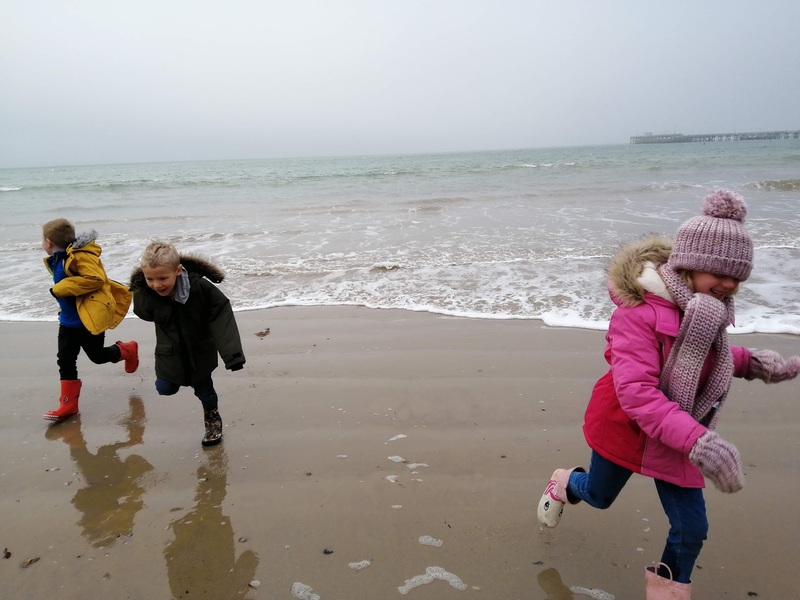 After lunch we decided to let the kids have a play on the beach - but it took them all of 5 seconds to get wet in the sea! 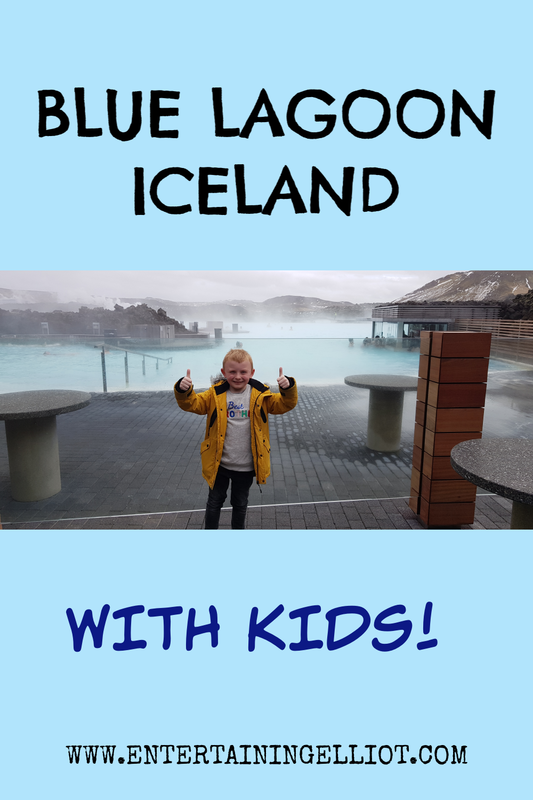 Elliot's legs were drenched and his brand new wellies were full of water! Fortunately we had spare clothes and hypothermia was averted. They loved it though!! On the last day of the holidays the sun was shining again so we decided to head out for a bit of Geocaching. 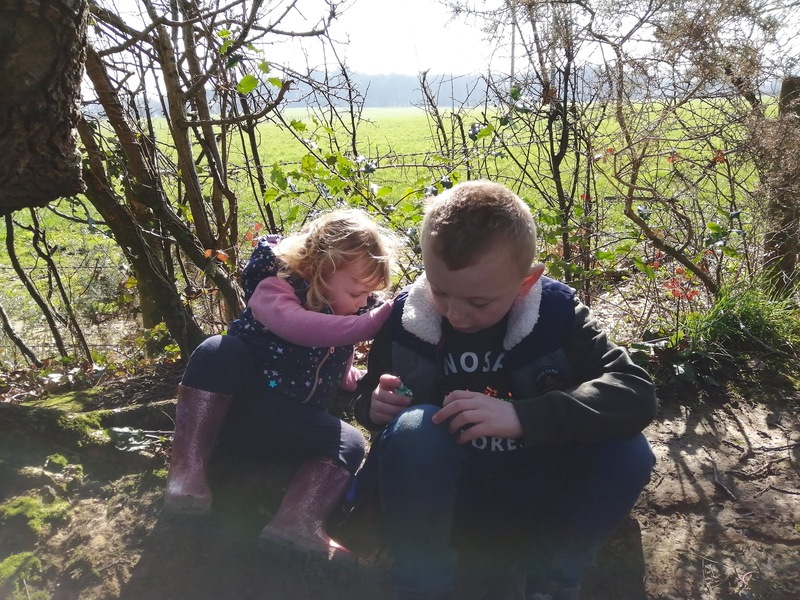 If you've not heard of Geocaching before, it's a great activity that goes on all over the world and is basically a bit like a treasure hunt! We drove to a nearby village and followed a very muddy track that led us to several caches. 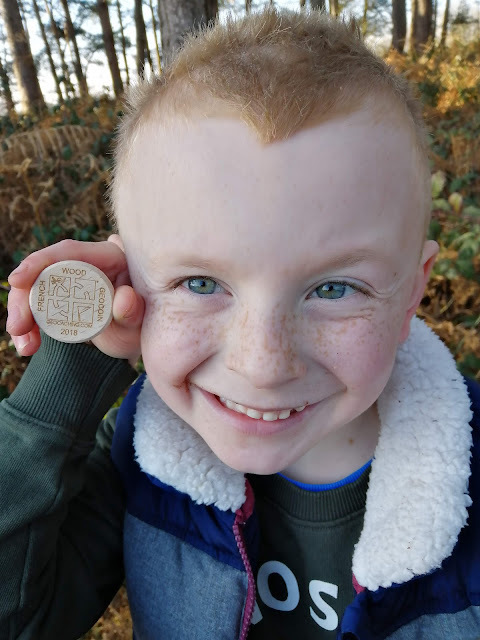 Elliot was really excited to find his first geocoin too! The weather was absolutely gorgeous - mad to think that this time last year we had snow! So that was our half term holiday -nice and busy just as we like it! 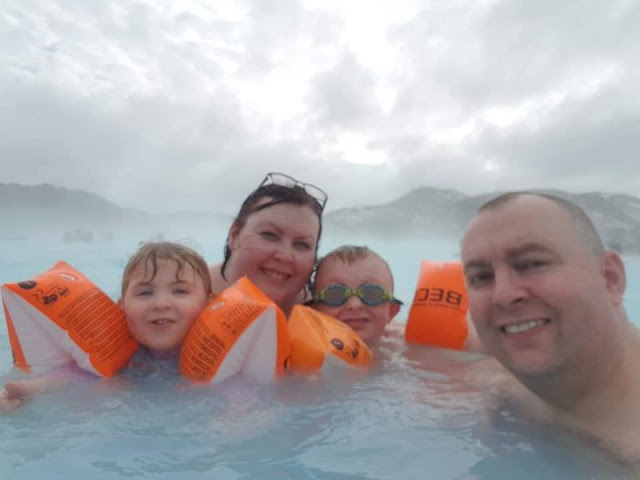 We did have a couple of days where we didn't go out and just chilled out at home - we all needed to recharge our batteries and it was nice not to have to rush out anywhere. We're on countdown to the Easter holidays now! This year we became Blogger Ambassadors for our local SEA LIFE Adventure Park in Weymouth. It's somewhere that I've been visiting for as long as I can remember and it's lovely to be able to take my own children and know that we are going to have a guaranteed great day out! We will be visiting lots this year to review all the exciting things happening but our first day out was to check out the Jawsome Sharks event. 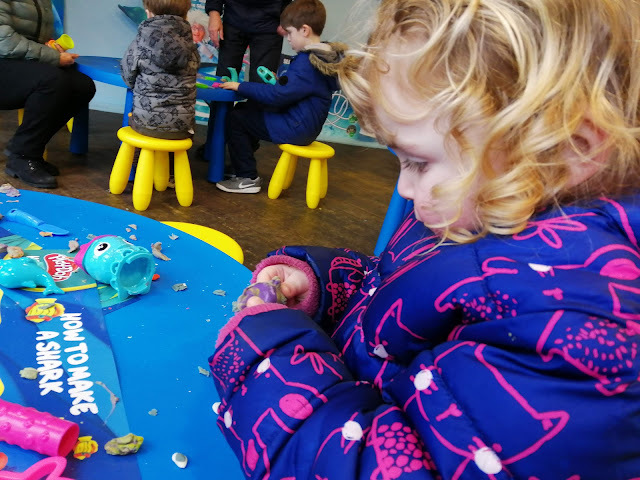 The first thing that caught my eye was the word PLAY-DOH - I don't know about your kids, but mine love the stuff so I knew this event would be a big hit! 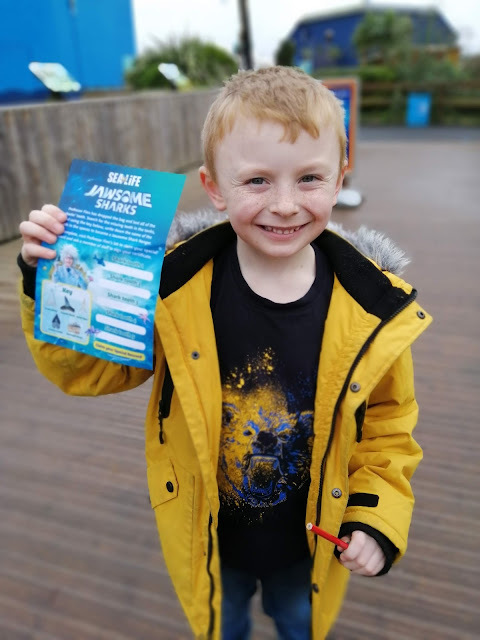 Guests are invited to become a Jawsome Ranger by assisting Professor Finn who has lost all the model shark teeth around the park. 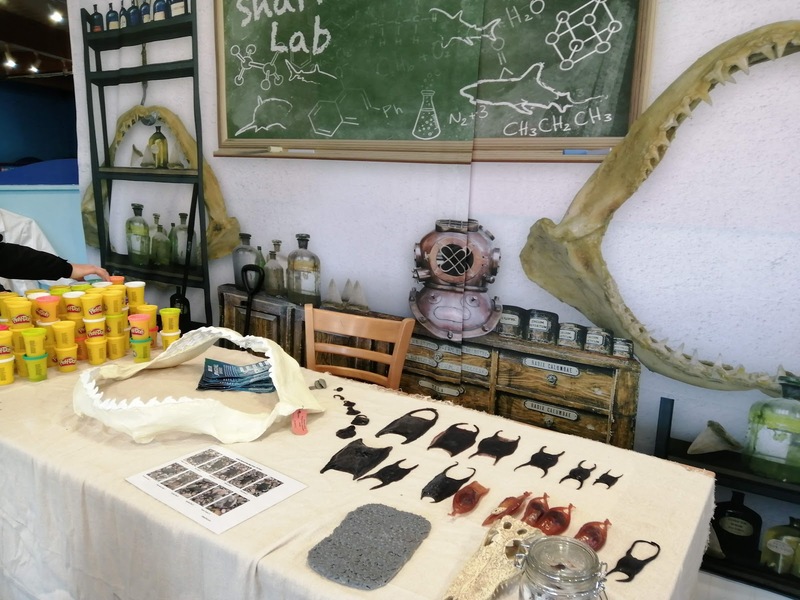 Along the way, guests will discover facts about the different species of sharks and will have the chance to learn more about the SEA LIFE sharks and rays. We couldn't wait to get started! At the front desk we were given information sheets and pencils and off we went. The park is very easy to navigate and each creature zone is numbered so it's very simple to see everything. It didn't take us long to spot our first shark tooth in one of the tanks and we had to then decide which type of shark is came from. The information sheets have a picture of all the teeth so it's nice and simple for little ones to figure it out. One of the biggest draws of the park is the amazing play area Caribbean Cove - in my opinion it is one of the best in Dorset. It is always something Elliot looks forward to and this visit was no exception - he raced through the zones in record time to get to the the play area! Fortunately, Costa Coffee was open so I was able to relax with a sneaky hot chocolate while the children played! 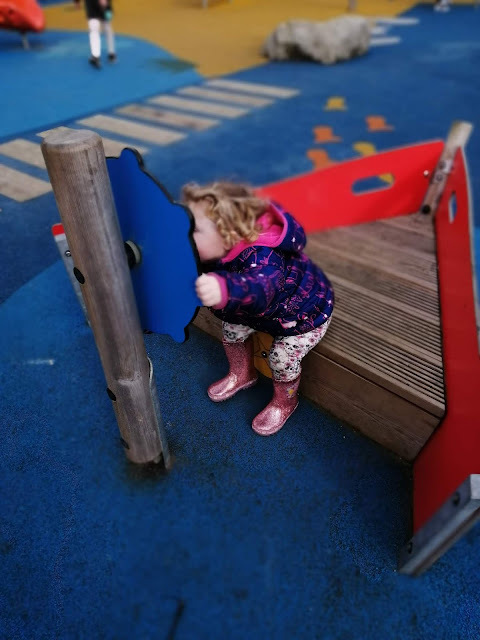 It's great that the play area is suitable for a variety of different ages - Elliot of course loves to climb up to the highest point and slide down the firemans pole but there's plenty for Erin too. She loves going down the toddler slide and sitting in the boat! I was wondering how I was going to drag the children away from the play area but fortunately there was a torrential downpour which had us running for cover of the Ocean Tunnel. I think we might still be there otherwise! I love the Ocean Tunnel and it's definitely my favourite zone - I was about to write that it's relaxing watching all the creatures swimming serenely above....it probably is relaxing if you haven't got two little ones nagging to find another shark tooth! "Come on Mum!!!" Fortunately the rain had stopped so we headed towards one of the newest attractions at the park, Fairy Penguin Island. 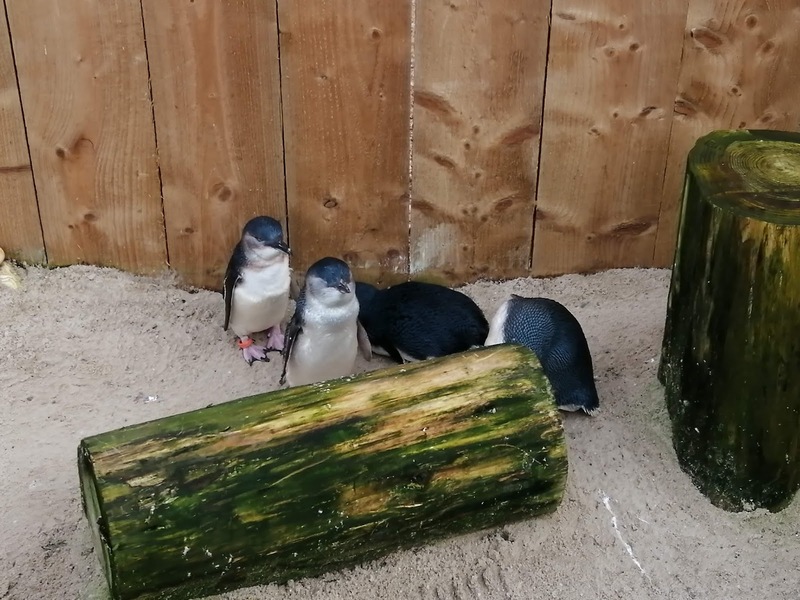 Here lives twenty of the cutest penguins you will ever see - the smallest penguins in the world in fact! Back to the Shark Mission...after finding our last tooth we were keen to head back to Professor Finn in the shark lab. There the children handed in their findings and were given a prize which was a pot of play-doh. In previous events they have received a special pop badge so this was a real treat and less likely to get lost in the boot of the car! I was expecting it to be a mini pot of Play-doh but actually it was full size and there were plenty of colours to choose from...Elliot swapped his about 6 times before settling for turquoise! The Shark Lab was a great place to learn about Sharks with lots of teeth on show and various items that can be found along the shoreline. My kids however were more interested in the activity tables where they spent ages playing with the play-doh and creating their masterpieces. 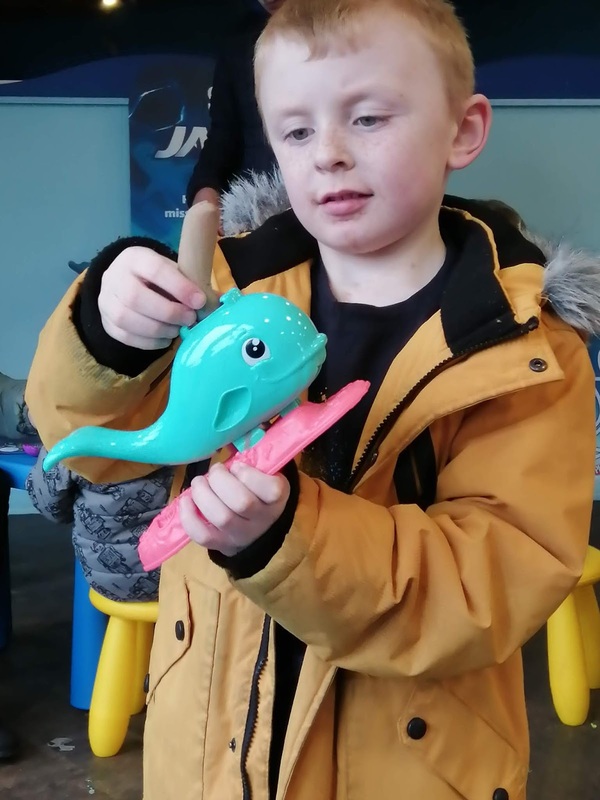 There were activity sheets detailing how to make your own Play-Doh shark but Elliot was happy to go freestyle! 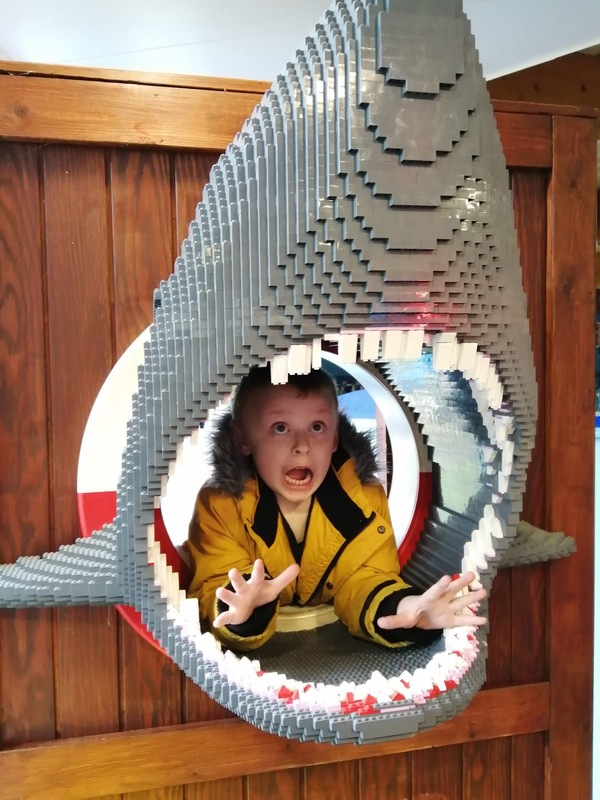 After a quick pose in the impressive Lego shark head, it was time to head home. We had a brilliant day and learnt lots of about sharks. We can't wait to visit again! 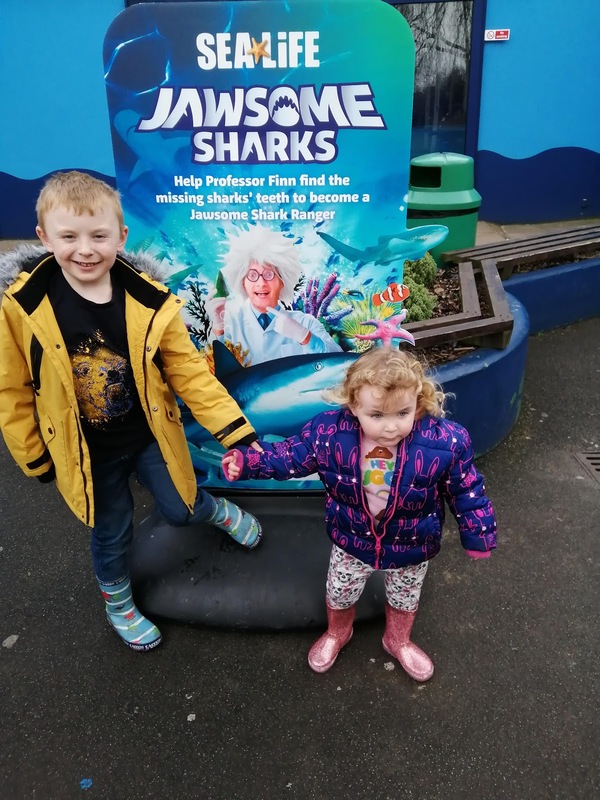 The Jawsome Sharks event is running from 16th February - 6th May 2019. For more information and to book tickets, please check out the SEA LIFE Weymouth website. 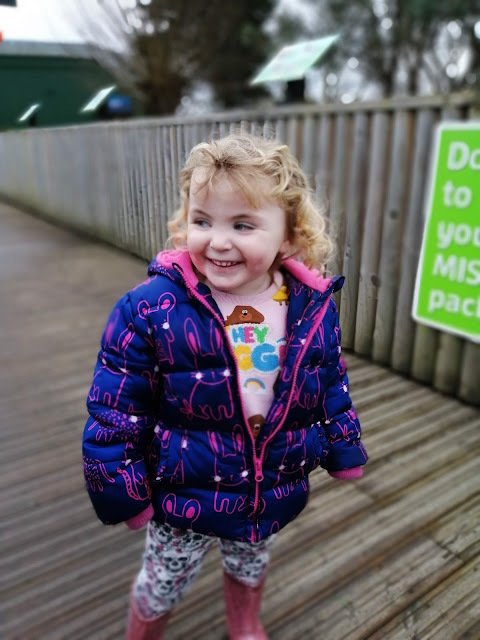 You may remember that we visited the Winchester Science Centre back in December and it was easily one of the best days out we've had as a family. We were invited back to experience the brand new activities for half term and Elliot was quite excited to hear that the live science show was centred around the Science of Magic! He has several of his own magic sets so he couldn't wait to see what tricks he would watch. The live science shows are running at regular intervals throughout the day ( 11am, 12pm, 1pm, 2.30pm and 3.30pm) and can be booked online when you purchase tickets for the Science Centre. We opted for the 11am one so when we arrived we headed straight downstairs and took our seats in the science show room. There are plenty of seats but little ones might want to sit on the end of the row to get a better view! It's a great show and well worth seeing if you are visiting this half term. It lasts for 25 minutes which is just long enough to hold the attention of the younger members of the audience. February half term also sees the return of the You Are Here!, a hugely popular 30-minute planetarium show that combines live performances with the immersive 360 full dome planetarium experience. The show takes you on a journey through space to discover "the most incredible, remarkable, mind blowing thing in the universe". Aimed at children and their families, they will love zooming into the planets and learning some facts along the way. The light up umbrellas are pretty cool too! Elliot said he really enjoyed "You Are Here!" and he liked seeing Mars best. 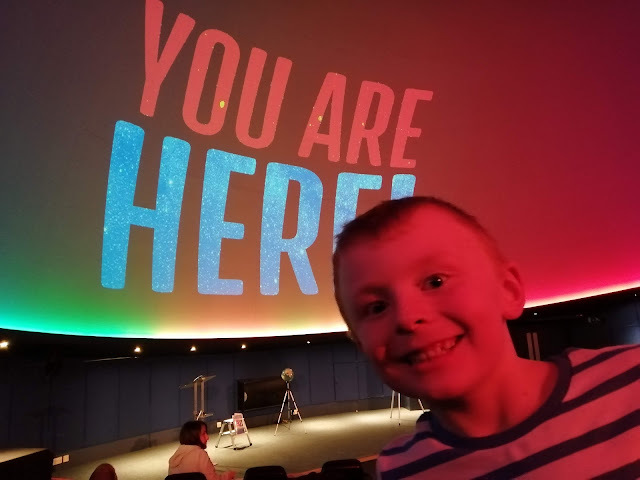 In between watching the science show and learning about the planets in the Planetarium, we had lots of time to explore the interactive displays in the Science Centre. And there are so many things to see and do! The kids were immediately drawn to the Colon Cafe again where they learnt about good and bad bacteria and what goes in and out your body. Elliot also loved the Science of Sport Zone where he tested out wheelchair basketball, took part in a rowing race and even found out how high he could jump! There are two floors of interactive exhibits, plus the new Explorer:Space zone featuring 20 fantastic modular exhibits. With so much to see, there is something for everyone. Even Erin - she might be too young to understand the exhibits but she enjoyed "helping" Elliot! She also loved the construction soft play area and spent lots of time in here whilst the boys explored the Space zone. We had lunch in the Hub cafe again but there are plenty of seating areas on the lower level of the centre for people bringing picnics. I also spotted outdoor seating and play area so this will be great in the Summer! We had another fantastic day at the Winchester Science Centre - it is fast becoming one of our favourite places to visit. It is perfect for a rainy weekend and I guarantee there will be something for all the family to enjoy. We can't wait to come back! 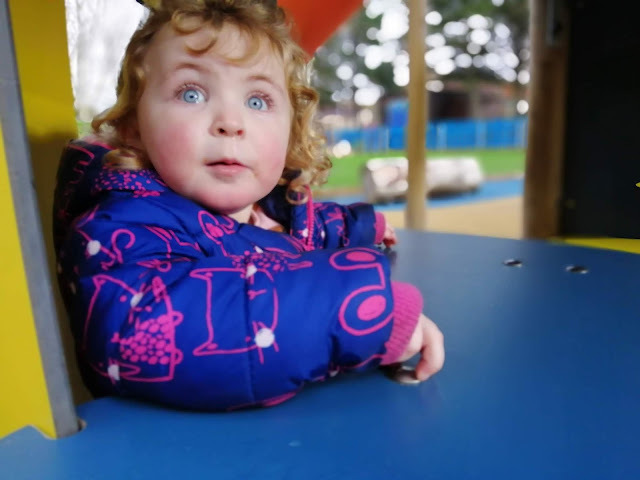 Tickets cost £12 per person with under 3's going free. If you book online at least three days in advance you will save 25% off. Friday 15 – Monday 25 February. You Are Here! planetarium shows are running at least twice daily 16 - 22 February. Tickets cost £5.50 per person with General Admission or £8.60 standalone. There is a £2 charge for visitors wishing to park on site. *Disclaimer - We were invited to Winchester Science Centre in order to conduct an honest review of the half term activities.